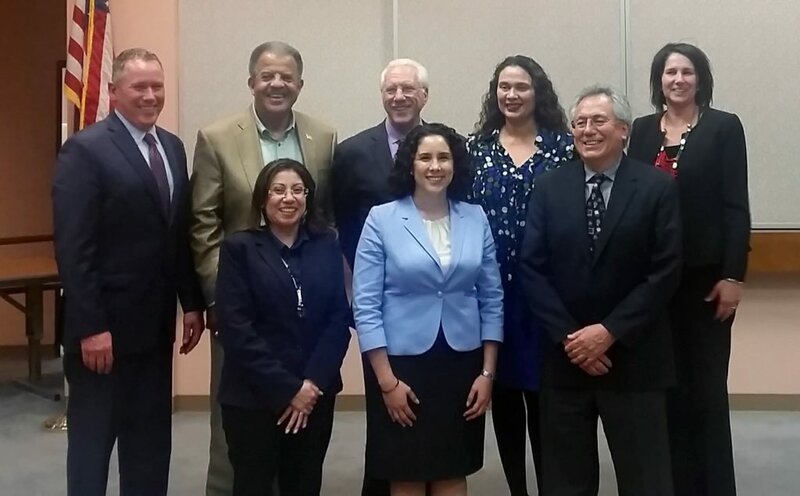 At a marathon special meeting last night, Elk Grove resident Nancy Chaires was selected to fill a vacancy on the Elk Grove Unified School District's Board of Trustees. Chaires, an Elk Grove Planning Commissioner since 2008, will fill the two years remaining for the district's Area 6 vacancy. Unanimously approved by the Board of Trustees for the appointment, Chaires was one of 12 seeking to fill the vacancy created when former Trustee Steve Ly resigned following his election to the District 4 seat on the Elk Grove City Council. One of Ly's opponents in November's Elk Grove City Council race was Chaires. Aside from Chaires, other notables seeking the appointment were former EGUSD Area 6 Trustee Jake Rambo and former Elk Grove City Council Member Sophia Scherman. Rambo was appointed to a vacancy in 2010 but was defeated by Ly in 2012. Employed as special programs consultant at the Migrant Education Office of the California Department of Education, Chaires said during last night's panel interview said she will focus on early childhood education and work to ensure the district's long-term fiscal health. She is expected to be sworn in at next Tuesday's regular district meeting. Chaires was sworn-in last night after being appointed. The voters have rejected this woman already. So what if Chaires lost an election? Abraham Lincoln lost at least eight elections prior to being becoming President of the United States. Congratulations Ms. Chaires. Keeps her in "circulation" until the Party Machine can get her in a real elected position. Mayor Chaires! "Mayor Chaires"...now that has a nice ring to it! Since we are handicapping local politics, lets think about this. Nancy will first need to be elected two years from now. Baring some Steve Ly clone, she should win. So will she make a run for Mayor Davis? At that point, it would make sense. Of course that assumes Mayor Davis fends off challengers two years from now. This whole appointment process also proved Sophia Scherman has still much to give, in her mind at least, so she is not going away gracefully. Will she make a run at the mayor in 2016? Stranger things have happened, but in a three or four way race she could pull the upset. Don't count her ambition out yet. If Sophia Scherman couldn't get the support of EGUSD Board President Bobbie Singh-Allen, then it was clear she wasn't right for the job. I am sure Singh-Allen had the pressure applied by both Jake Rambo and Scherman. Good for her for doing what is right for the Board, the school district, the students, teachers and staff. Ms. Chaires did not earn this office. Don't bet on her staying in office long. Perhaps, the giant is awaken again. A challenge to this appointment is coming in the form of a special election. Get ready to see democracy in action. According to County Voter office, Total registered voters 138,500. 1.5% is 2,077 signatures. last regular election for governing board members.